The Blanchard Orchestra in Texas. 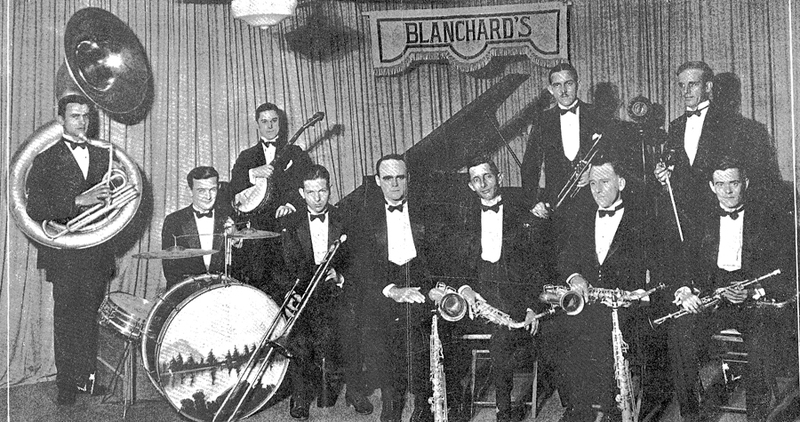 Claude Blanchard, the leader, is holding a trumpet (fourth from right). I’ve been researching the Blanchard Orchestra, which Snoozer joined as a kid when he was just 12 or 13 years old! In Bogalusa the band played constantly from January 1920 through fall of 1922, when Claude Blanchard moved to Houston for work with the rail road. In Houston, Claude built his orchestra back up, and earned a great reputation playing on KPRC and for hotels and clubs. In 1925, Snoozer left Louisiana and headed to Houston to join his old Bogalusa friends — Blanchard and Frank Tilton, a blind, wunderkind piano player — who were earning money and having a ball playing music, to great reception by Texas audiences. The family is scanning the book and sharing images with me… plus, there are boxes of photographs to go through. And letters! Claude Blanchard, Sr. was a letter writer, and his wonderful descendants had the foresight to save many of the letters. Of course, I am hoping to find some photos and references to Snoozer in the mix. Claude Jr. also has wonderful memories of the band… He was born in 1925 and remembers singing novelty songs — he and his little brother Don — with his Dad’s orchestra. I’m interviewing him to record some of these delightful memories for posterity. A second post will follow this, to discuss a recording mystery. I’m a serious jazz fanatic as well as a cornetist. I’ve been introduced to Snoozer Quinn and have a suggestion on how to recover the recording on that studiodisc. I’d get in contact with the folks at Archeophone records. These are the people responsible for restoring the King Oliver sessions from 23 and other early recordings. Chris, thank you so much for the suggestion. I reached out to the folks at ARSC and a wonderful person named Doug Pomeroy offered to assist me. Unfortunately, the record did no contain music, says Doug. It was a serviceman reading a letter to the folks back home. I should be receiving the digital copy as well as the original acetate back this week, at which time I’ll be updating people on this blog.